I hope the summer’s been as warm, or wet, as you like it – and long may it continue. 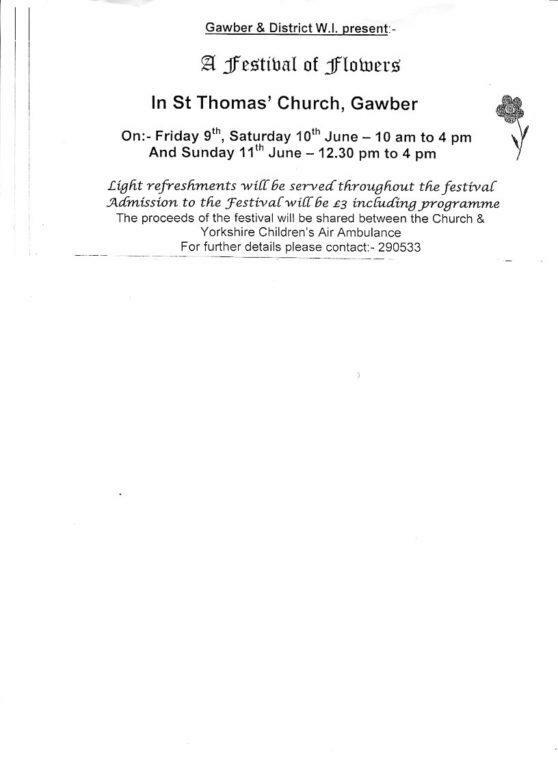 Attached is a small flier for a long weekend (9th, 10th, 11th June) flower festival at St Thomas’ Church, Church St, Gawber, opposite Barnsley Hospice, S75 2RL. I’ve been told that taking photos will be fine, so anyone after some flower pictures should find some good displays here. £3 entry, refreshments available – money raised goes to the good causes indicated on the flier. The church and it’s surroundings also provide some interesting Architectural and Record shots, as well as interesting images for our Landscape and/or Open competitions. Photographs of stonework also provide good tonal Black & Whites. Monday 5th June is our next photoshoot visit, and having dried out from the last one, I’m all ready to get wet, again, but this time at Newmillerdam. Anyone interested in this visit, please be at the Emmanuel Church for 6 o’clock (pm), or 6:15/6:20 ish in the car park at Newmillerdam. Parking’s free after 6, I believe. If anyone needs any practice before that – The Ecclesfield & District Equestrian Club is holding their annual John Rhodes Memorial Show on Sunday 4th (TOMORROW) at the EDEC Club Field (on the A61, opposite junction with Bracken Hill, Sheffield, S35 1RS). For those who haven’t been before, the entry to the field is a small dirt track leading off the A61 on a blind bend. If heading from Tankersley, the safest way to access it for the first time, and make sure you don’t miss it, is to turn into Bracken Lane (High Green), turn round, then drive back out of Bracken Lane – turning right onto A61, then an almost immediate left up the dirt track. You should see the event and cars/horse-boxes in the field. It’s free to spectators and anyone from Barnsley Photographic Society is welcome. This is in a horsey field, and wellies or hiking boots are recommended. Also, don’t forget to bring a sack and a shovel if you want to take away lots of free-stuff for helping your rhubarb grow. They have four rings (event fields) taking place most of the day, from 9/9:30 until about 4/4:30, and this is an event to get some Photojournalism/Sport/Action shots as well as a few Portraits. You can take snacks, flask, sandwiches, etc – or buy some at their kiosks – usually burgers or hot dogs – maybe chips if they’re expecting royalty. I generally get there for 10 ish, and stay for a few hours, but anyone can come and go whenever they please. Weather forecast looks ‘good to wet’, so it could provide a bit of practice for Monday night’s soaking. In these days of digital cameras, who’d have thought we’d still be doing so much wet photography?